It's October. For those of you who live in pats of the world that have normal weather, October means cold. I don't like cold. (Although it gives me a very nice excuse to wear my lovely navy winter trench coat!) My feet are freezing as I type and a fire has already been started in the woodstove. WINTER IS COMING! So as much fun as it is to talk about Christmas-y and cold books like Let It Snow (which comes out today, by the way), I am in no way ready for the holiday season...yet. I am still in the mood for a nice WARM, summery read. Enter In Your Room. 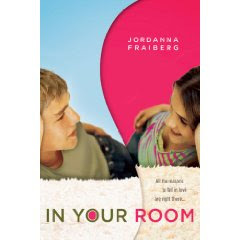 In Your Room was surprisingly candid and refreshingly humorous and human. The story is fast paced, and Fraiberg's clever writing downplays the predictability of the plot, forcing you to look at the novel with new eyes. Molly is an unpretentious character, but yet she has slightly selfish feelings about her mother's new marriage, and Charlie, despite being thoughtful, imaginative, and funny, has his faults as well. It's these imperfections in the lead characters that lend to the plot twists in order to In Your Room an enjoyable, quick, and relaxing read that you'll want to visit again and again. In Your Room comes out two weeks from today, on the sixteenth, from Razorbill, so go here to pre-order now! Also be sure to stop in every Thursday for some extra fun special things with Jordanna Fraiberg, the lovely author! Do not let cold and wet and icky October get you down! Survive until Halloween! There will be candy! And then the Christmas season! But until then, In Your Room! Sweet! Jordanna is definitely getting a ton of promotion this month. She's my AOM. She definitely deserves it though. In Your Room was amazing! In Your Room sounds like a fabulous book from I've read!